Happy Thursday! This week our spotlight weekly theme is stripes! Stripes are so versatile. Today, I went with a simple jeans and a t-shirt look. A basic look, but so easy to add a pop of color to make the look pop! Come share your stripe looks with Elle and I! 1. We kindly ask that you follow the two hosts: Elle from Living in Color Style and Jacqueline from Stylin' In St. Louis via Bloglovin or GFC, and of course, our co-host Jacy of Love, Lenore blog. Spotlight: Our spotlight this week is Alice of Happiness of Mid-Life! Alice has such a pretty white lace dress! She paired it with a cute pair of leopard shoes that really pulled this entire look together! So beautiful! Be sure to check her fabulous blog! Nextweek: Next week our spotlight weekly theme is NEON! Thanks for linking up! See you next week! beautiful look! love the pop of colour! Love the stripes with the pop of color! Totally an outfit that I would wear. Jac, I love your sweater, bag and wedges. Beautiful jewelry too, as always. One can never go wrong with stripes, especially of the Black+White variety. I am trying a new trend (for me) with my B+W Striped Skirt today. I'd love to hear your thoughts. Elle and your co-host look great too. And I loved Alice's look also. I own a White Lace Dress - will try dressing it down like she did, next time. Great link up! Love the stripes! Love this entire look, especially the pop of color with your bag! I get so much inspiration from you! So pretty! I was so excited about this link up because I am addicted to stripes! I LOVE your top and how you styled it! Great look! Oh my! All you 3 ladies have nailed the striped look & have so inspired me a lot more to go wear it already! Love how you styled your striped top with the fun pink bag! Love the bold black and white stripes, babe! :) Happy Thursday! Great chic outfit and your hair looks so cute pulled up. Thank you so much for the feature! Love this bold stripe, so cute on you! love that sweater and your bright bag! Thank you for including me in your linkup this week! love this look on you. its such a no brainer but looks great! Love the neutral outfit with the pop of pink! Stripes are my weakness. I can never get enough! Love that striped top, and the crossbody bag is too cute! Love your crossbody! Color is so perfect! That bag is amazing... I love a pop of pink! I am a sucker for anything with stripes and that neon bag really pops against your sweater! I just love that sweater! It looks perfect with that pop of pink too! 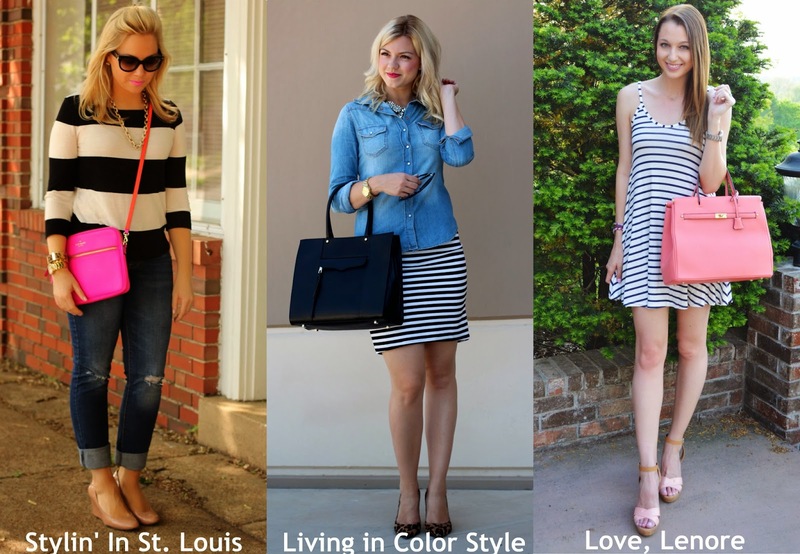 I love stripes, but I am all about your bright pink bag! It's the best! Love the pop of hot pink, it really makes it! This is so cute! I love the whole ensemble. What a fabulous look! Love that pop of neon! I LOVE stripes, it's easy to wear and looks so chic. Especially t-shirts looks so french style.